Click on the image for the full size pics - Thanks to NickSki, 3VT, Brian, The Buckles etc. 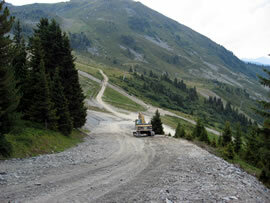 The main theme for the improvements will not at first sight be seen as it is mainly in the form of huge amounts new cannoning and piste reshaping. The Bouc Blanc and the Boulevard des Arolles (now renamed Arolles as it's now a lot wider) now have cannons down to the Gondola stations guaranteeing links back over from Courchevel and able to improve conditions when necessary. The Murettes piste down into Le Praz and by their beginners drag lift have also had snow cannon piping laid which will make for an alternative run down there when there's poor snow cover (and also mean that the black Jockey's run from the top of La Tania - a favourite in bad weather will be skiable to the bottom for more of the season). There's also plans for a new swimming pool / sports complex in 1850 and a new Tourist Office with left luggage and waiting room over in 1550. Also in the Courchevel area is a new piste from the top of Pralong & Biollay chairs straight down to the Suisse chair avoiding the bottle neck of the right turn along the path. The new piste follows a similar route to the old Super Pralong drag lift from a few years ago and was a popular easy off piste run behind the pisteurs hut on the usual locals route up to Saulire using Biollay and Suisse (the "no need to remove skis" route to the top of Saulire). 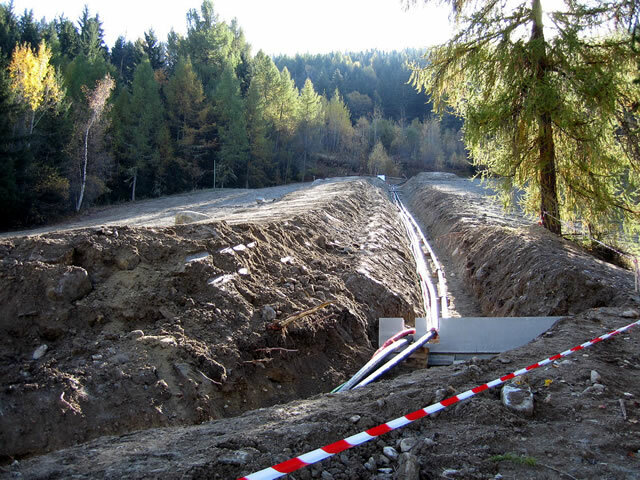 The link from Saulire to Méribel (under the banner to Méribel) has been widened with cannons going in all the way down Biche making another fully cannoned link. Pic below shows the 1850 side of Saulire - more cannon works going on. 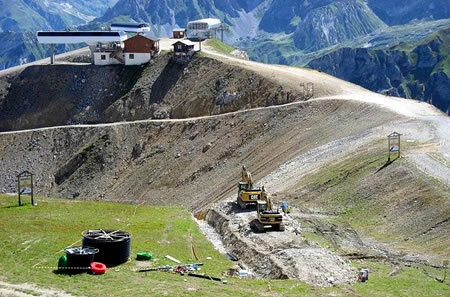 In Méribel, the Tougnète gondola is getting completely refurbed for next Winter (this now runs only to the mid-station with the advent of the new Tougnète 6-man chair to the summit). There's also been work on The Moon Park fun area - faster, higher, bigger, longer jumps no doubt - more and more rails appearing on the parks around the 3Vs too. 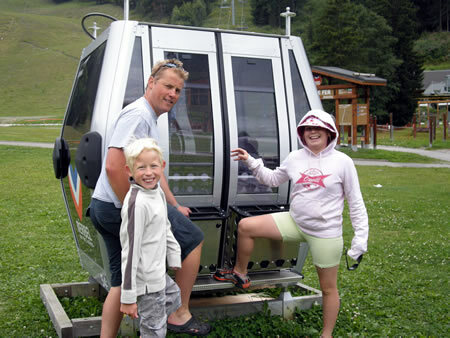 The Cairn and Caron gondolas have been replaced with modern 8 seater cabins, the upload capacity being doubled. There's a new blue piste under the gondolas too. The link from the Granges chair to the St Martin chair is having cannons installed further increasing the areas covered by man made snow. 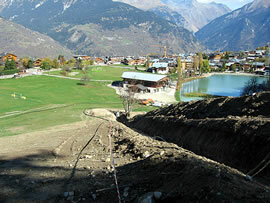 Val Thorens fun park is also being made larger, there's a new drag going in and more jumps and a long rail slide. In the Les 2 Lacs area there's a new Skier / Boarder Cross run being created - always a laugh having a run with your mates (especially if everyone comes out without injury....). 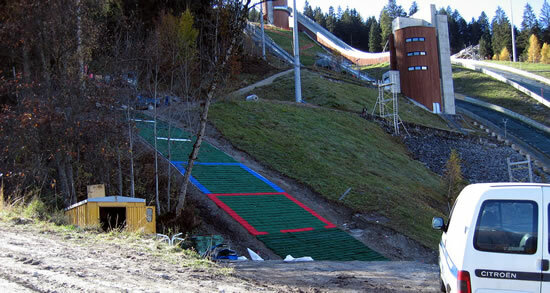 It's 1.4 km long with 350m of vertical, lots of jumps, banked bends etc are promised. 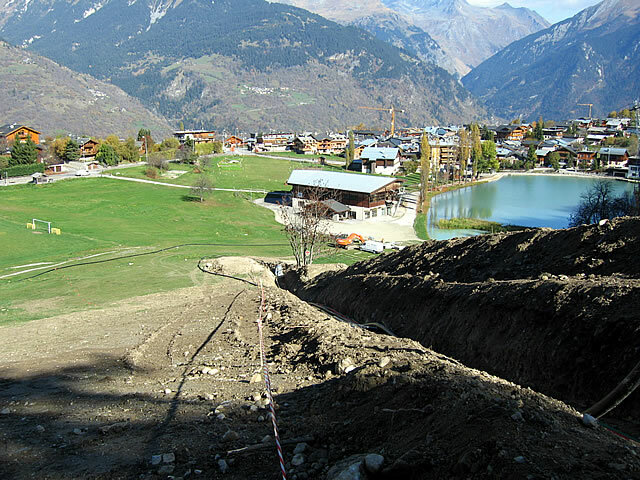 A new very long sledging track is going in at Les Menuires. Kangaroo Simon (as know in La Tania for a long time) is running Brewskis in St Martin this year - evening only though. Kenny from the Telemark will be running La Tsaretta in Les Allues this Winter too. 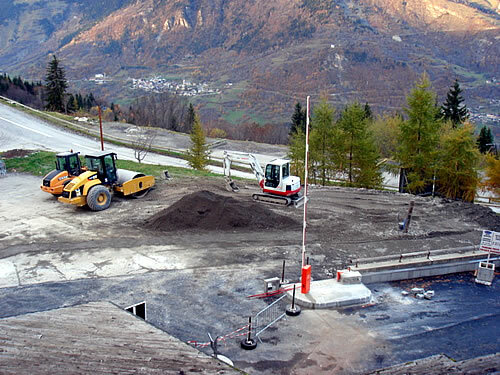 Val Thorens is getting a new coach terminal and the "Jump 'Air" - a practice jump over a large stunt man matress is being installed. Beats landing head first on the snow (apparantly). New Magnestick Safety Devices for kids are going on some more chair lifts including the Dou Des Lanches 4-man chair above La Tania. Kids wear a brightly covered backpack which has a magnet in it (which also acts as a back protector) that "sticks" kids to the chair until it's time to get off. Six Chair Lifts now covered by these devices in The Three Valleys. There's a Holiski Pass multi-resort pass out for various ski areas around the Savoie but S3V the main Courchevel lift company aren't taking part (Méribel Alpina is though). Can be used in Tignes/Val, Paridiski etc. Morning Passes only for the Three Valleys are at last available this season too. While the new creche facility is built (between the Montana Hotel and The Gondola station) there will be a temporary facility made available for children from 3 years. 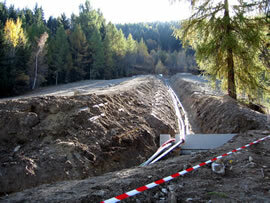 It will be located between the Maeva Britania parking (near the Sherpa) and the road. It plans to be open from Sunday to Friday from 8h45 to 12h30 and from 1h45 to 5h30, no lunch facilities are provided. Prices are €22 for a half day and €42 for a full day (€100 and €180 for week options of 5 or 6 days depending on day of arrival). After some debate the La Tania opening day for Winter 2008/9 has finally been confirmed as Saturday 13 December 2008. Courchevel 1850 opens a week earlier and Val Thorens is scheduled for 22 November. Further details, plus the 2008/9 lift pass prices on the Three Valleys 2008/9 Lift Pass Page. 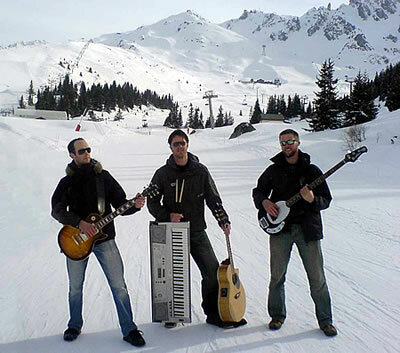 The opening night for Pub Le Ski Lodge is confirmed as Friday 28th November 2008 with the excellent Bring Your Sisters playing live once more. 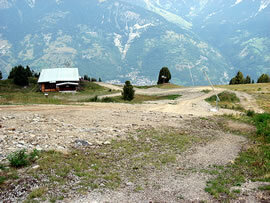 The La Tania Charity Day is now confirmed as Wed 15th April 2009. This is the final week the La Tania lifts are open (1850 opens for another week and Val Thorens another week after that) but there should be plenty of folk around as it's Easter Monday on 13th April. New for next season - The Ski Dating Week! Spring into a new season and a new relationship with a whole week especially dedicated to singles with a Ski Dating Package including accommodation, lift pass, ski equipment and many special activities from only €390. Events to include Speed Cabine Dating in the La Tania gondola followed by a Speed Dating Fondue in a mountain restaurant and a Torchlight Descent down to La Tania plus a Traffic-Light Party (if you're free wear green, red if you’re not and orange otherwise) and Ice BBQ on the piste.